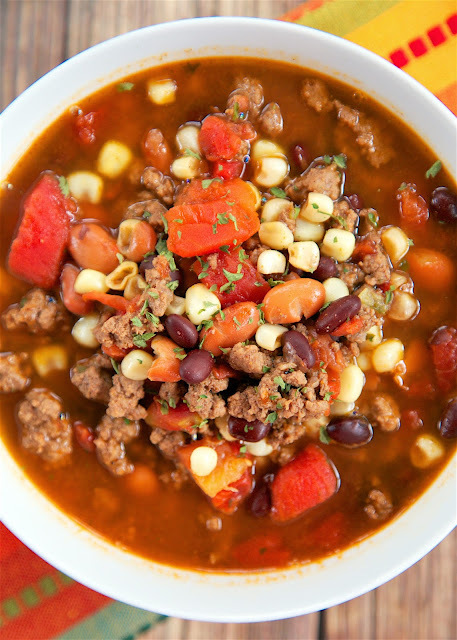 Taco Soup recipe - ground beef, taco seasoning, Ranch seasoning, pinto beans, black beans, corn, Rotel and water - ready in 20 minutes! Great freezer meal! Can also cook in slow cooker all day. 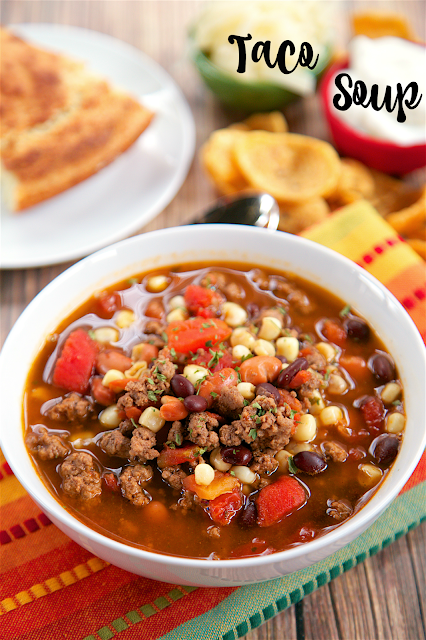 Taco Soup has taken on a life of its own at our office. Everyone is making it. We've even had a Taco Soup potluck! We are all completely addicted! I made a batch in my slow cooker on Sunday. It was absolutely delicious! We both went back for seconds. It even tasted great for lunch yesterday. This is so quick and easy. 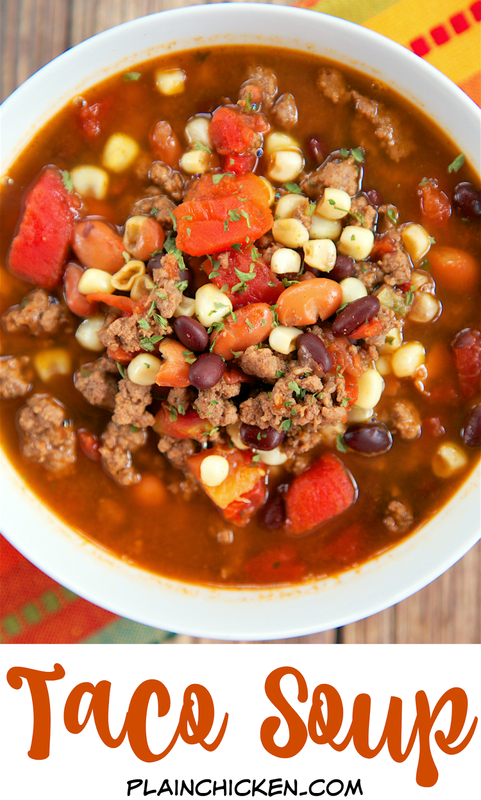 This soup can be made on the stove or in the crockpot. I usually make it in the crockpot so dinner is ready when I get home from work. Cook and drain ground beef. Drain and rinse pinto and black beans. 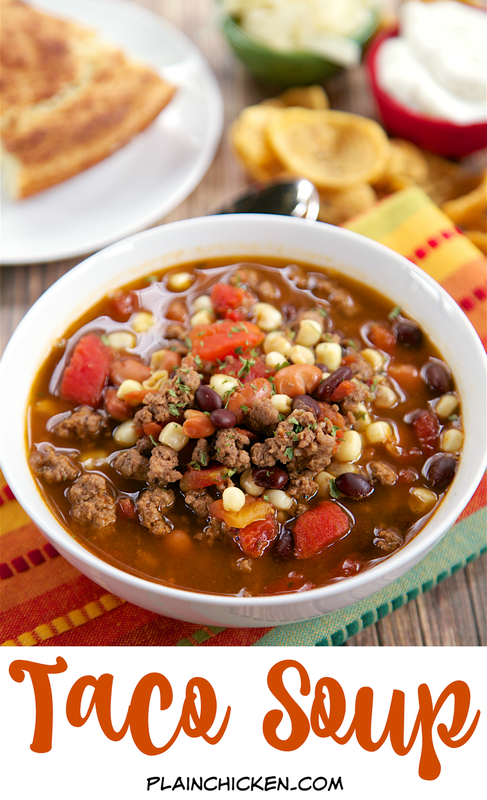 Mix beef, beans, tomatoes, corn, Ranch mix, taco seasoning and water in crock pot. Cook on low for 8-9 hours. Serve with Fritos, cheese and a dollop of sour cream. This looks yummy...but I am not a fan of beans....do you think this recipe would work w/o beans? Oh yes, that looks so good! And easy. I can see why ya'll are all addicted. I love using Mexicorn in it to add some peppers without the effort. This looks delicious! Oh, how I love tacos! I was going to make it based on the first pic, but then the one with fritos and sour cream !?! I was thinking a side of corn bread, but you don't really need it with the Fritos. Maybe a side salad would be nice. Headed out to the store for some ingredients right now! 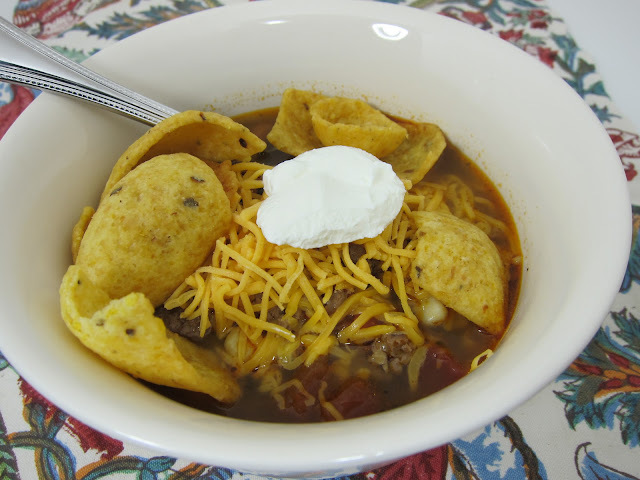 Taco Soup is some awesome stuff. i want to have a bite of it. so yummy. This is cooking in my Crock pot right now! Can't wait for dinnertime! I like your version of taco soup. Don't you just love those Frito Scoops? I used the largest can of V-8 juice, & a little water. YUM! Thanks again for all the time you put into this great site! I just made this and it was delicious! This recipe is a keeper. Thank you! love this recipe! It gets even better the next day! My wife uses shredded chicken instead of the ground beef! I need to try it with chicken next time! This stuff is the bomb! It was a huge hit at my Super Bowl party yesterday. I doubled up on it & still had none to take home. It's now in my regular rotation. Did a double batch again yesterday. Again, very nice. We did this a third time the other day (double batch). I can eat it for lunch at work all week & not get tired of it. One of my favorite soups. Pics on my page. What weight is the taco seasoning mix please....ours come in 2 sizes here in Australia. Also would a tin of crushed or chopped tomatoes work???? I can't wait to make this!!!!! It is a 1oz packet of taco seasoning. I think extra chopped tomatoes would be great! Enjoy! Is there anything I can substitute for the Ranch Seasoning? Like Ranch Dressing itself?